SAN MATEO (September 26, 2012) – Duck Duck Moose, the creator of award-winning educational apps for children, announced today that it has received $7 million in Series A venture funding led by Sequoia Capital and Lightspeed Venture Partners, with participation from Stanford University. The funding will be used to grow Duck Duck Moose’s popular family of apps, expand the executive team, and add illustrators, animators and engineers to the rapidly growing company. With more than 2.4 million paid app downloads, Duck Duck Moose has become one of the industry’s most popular designers of quality, educational children’s apps. This month, Duck Duck Moose earned three additional Parents’ Choice Awards for its most recent titles, Trucks, Princess Fairy Tale Maker, and Superhero Comic Book Maker, making it the only company to win 14 Parents’ Choice Awards in the mobile category. Every Duck Duck Moose app has now been recognized with this iconic seal of approval from the Parents’ Choice Foundation, the nation’s leading nonprofit guide to quality children’s media and toys. Duck Duck Moose was founded in 2008 by three friends who were inspired by their children’s love of learning. Combining a unique set of design, engineering and creative skills, the Duck Duck Moose team has invented original apps that teach nursery rhymes and songs, introduce early learning concepts in literacy and math, and encourage open-ended creative play through drawing and storytelling. 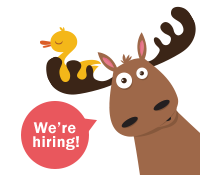 “Kid testing” is a central element of Duck Duck Moose’s design process; the team also works closely with teachers to ensure the apps are developmentally appropriate and focused on critical early education skills. All of the apps feature original characters and stories developed by Duck Duck Moose’s creative team, and they include music produced by two of the founders who are classically-trained musicians. Founded in 2008 by three friends, Caroline Hu Flexer, Nicci Gabriel and Michael Flexer, who share a passion for education, design, music and play, Duck Duck Moose creates some of the most loved educational apps for children. The company has designed and built 14 top-selling apps, from its first musically-focused title, Wheels on the Bus, to its most recent storytelling app, Superhero Comic Book Maker. Every Duck Duck Moose app has earned and sustained top rankings in the iTunes and Android stores, and they have received dozens of awards, including Parents’ Choice awards for all 14 titles, 13 Children’s Technology Review Editor’s Choice Awards, and a KAPi award for the “Best Children’s App” at the 2010 International Consumer Electronics Show. Lightspeed Venture Partners is a leading global venture capital firm with over $2 billion of committed capital under management. Lightspeed’s investment professionals and advisors are located in Silicon Valley, India, Israel and China with Lightspeed China Partners. Over the past two decades, the Lightspeed team has backed more than 200 companies, many of which have become leaders in their respective markets, including Blue Nile, Brocade, Ciena, DoubleClick, eHealth, Fusion-io, Informatica, Kiva Software, Kosmix, LivingSocial, Lucky Pai, Maker Communications, Playdom, Provigent, Riverbed Technology, Solazyme, TutorVista, Virsa Systems, Waveset, and XtremIO. For more information, visit the Lightspeed website: www.lightspeedvp.com. Sequoia Capital provides venture capital funding to founders of startups who want to turn business ideas into enduring companies. As the “Entrepreneurs Behind the Entrepreneurs”, Sequoia Capital’s Partners have worked with innovators such as Steve Jobs of Apple Computer, Larry Ellison of Oracle, Bob Swanson of Linear Technology, Sandy Lerner and Len Bozack of Cisco Systems, Dan Warmenhoven of NetApp, Jerry Yang and David Filo of Yahoo!, Jen-Hsun Huang of NVIDIA, Michael Marks of Flextronics, Larry Page and Sergey Brin of Google, Chad Hurley and Steve Chen of YouTube, Dominic Orr and Keerti Melkote of Aruba Networks, Tony Hsieh of Zappos, Omar Hamoui of Admob, Steve Streit of Green Dot and Reid Hoffman and Jeff Weiner of LinkedIn. To learn more about Sequoia Capital visit www.sequoiacap.com.